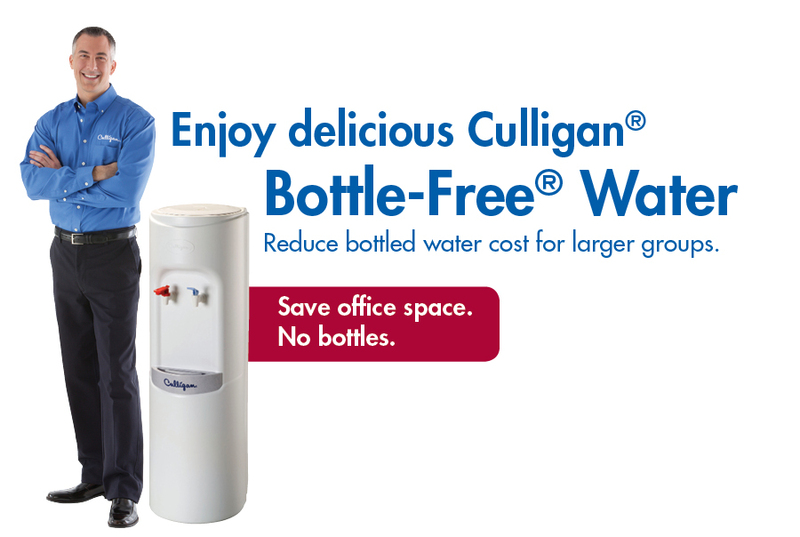 Your local Culligan Man can recommend the right bottle-free solution for you. Bottle-Free® is hassle-free. Never run out of water, eliminate bottle deliveries and receive one predictable invoice. It’s more sanitary. Our coolers provide water that is never exposed to contaminants in the air or touched by human hands. No more lifting 42-lb. bottles. Prevent injuries, eliminate spillage, and get out of the bottle storage business. It’s better for the environment. Keep plastic out of landfills and support your company’s green initiatives. Save money. Bottle-Free® Coolers can offer significant cost savings compared to your current bottled water spending, not to mention savings in back-office processing. Looking for a Culligan Bottle-Free® alternative for your home? Check out the Culligan Aqua-Cleer® Advanced Drinking Water System. The same great filtration, but installed at your sink!